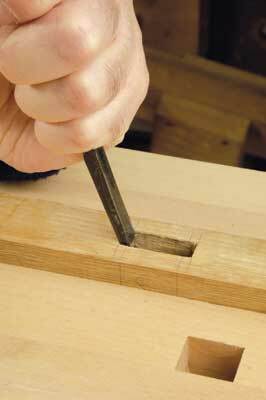 The mortise and tenon is probably the most used structural joint in furniture-making, and one of the oldest. You only have to look in a few English barns or churches to know this. In most cases it is very strong. In uses like frame and panel construction and doors of cabinets, it does not suffer from much stress or racking. 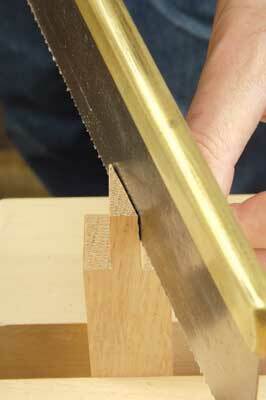 So in cases like this, I would not use a wedged joint, unless you want a purely decorative effect. Personally, I think that used in this way, it could look a little overdone. There is however, the exception to the rule. The furniture of Greene & Greene uses a lot of decorative joints and yet somehow, they do not look overdone. 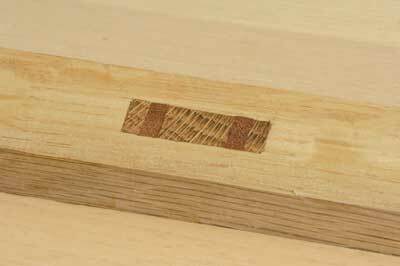 Many of these joints are not in fact wedged but just through decorative joints. Darrell Peart is a modern exponent of their style and has made many fine pieces. There is a very clean lined blanket chest which I like - but I am a bit partial to blanket chests - such as those found in the book In the Craftsman Style in the projects section by John McAlevey. Kevin P Rodel who makes American Arts and Crafts furniture in the USA, uses them effectively but subtly, in many of his pieces. In this country, it is always worth looking at the work of Alan Peters, Andrew Lawton and Mark Ripley. There is nothing complex about these joints in principle, it just requires neat work and a little careful thought. The real advantage to using wedges is the structural strength which they give to the joint. There are a few points to remember, crucially the grain orientation; get this wrong and you will split the leg, top or rail you are going into. 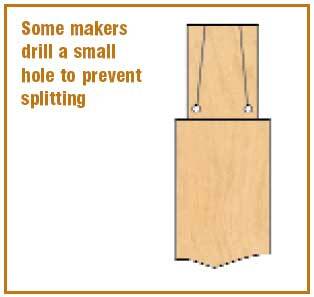 Always make the wedges spread at 90 degrees to the grain direction, so that the pressure of the wedge is against the end grain and NOT with the grain. First step is the mortise of course. As with all joints, crisp, clean cutting is essential, particularly with an exposed joint like this, so err on the side of undercutting and cleaning up with a very sharp chisel. The mortise can be cut in a number of ways, whichever suits you and the equipment available to you, from routing or drilling and cleaning out, or on a dedicated mortiser. Precise and sharp marking out is the key, particularly on the exit side. It is worth investing in a really good mortise gauge if you can. If you have marked the width with a pencil, remark on both sides with a knife. This ensures you have a crisp line to cut to, and avoids tear out. 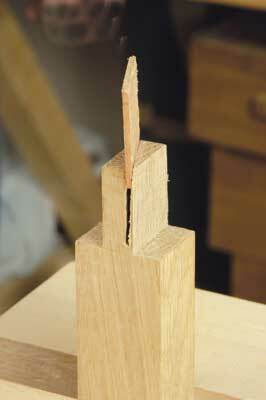 Once you have your mortise you need a tenon! Again there are of course, any number of ways you can cut these. Very often, if I was making stretcher rail joints on a small table and I only had four to cut, I would do it by hand. It made for a quiet time at the bench and kept my hand in, and by the time you had set any machine up to do the job, it turned out to be just as quick. I like to keep things simple, and my favourite way of cutting tenons is on an accurately set up bandsaw. A bandsaw can produce very accurate and repeatable results, and many makers like David Charlesworth and Kevin Ley, cut their dovetails on one. There are also numerous ways of using a router for this of course, but they are noisy, dusty beasts - only my personal opinion, I hasten to add! 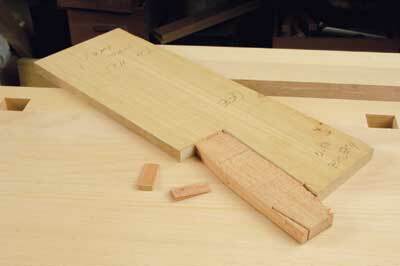 It is a different matter if you have a lot of tenons to cut and for this, a spindle moulder comes into its own. Not many of us have one of these though, or are cutting the kind of quantity that would justify one. 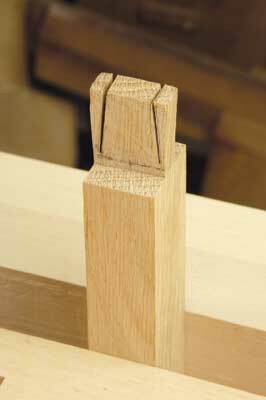 Remember to make your tenon longer than just the thickness of the rail it is going into, otherwise you will have nothing to trim off. I usually allow about an extra 4 or 5mm. 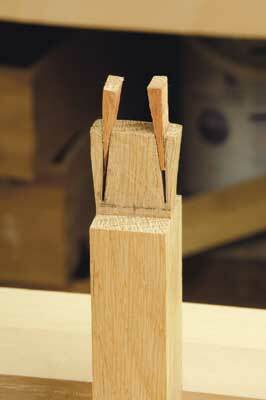 Dry fit your tenon and shoulders in the normal way. 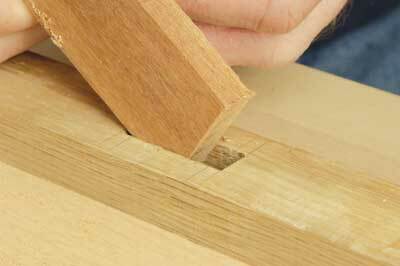 Once you have a clean fitting joint, mark out the amount needed on each side of the mortise to allow the wedges to spread the tenon. I have found 4mm works well. Mark out with a pencil initially and then scribe in with a knife. Now chop back to each knife line, tapering your cutting in towards the bottom of the mortise, thus creating the wedge shape that the tenon will expand into. Next you need to cut the wedge slots. Some makers cut straight vertical slots - I prefer to angle them. 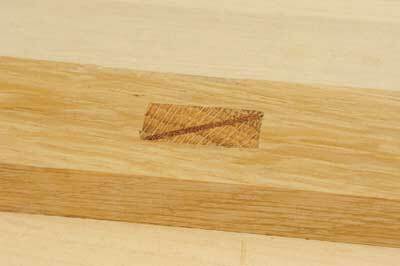 Both methods work, but if you put straight slots too far into the middle of the tenon, the waste may not bend, conversely slots cut at an angle too close to the edge could snap off. I still prefer the angled variety myself. To make sure the slots are spaced evenly, I use a marking gauge set at the same distance as the cut back on the mortise, so 4mm. Make sure you don't cut too far down! I usually stop about 5mm from the shoulder line. Most makers use a contrasting wood for these picked out from another detail on the overall piece they are making, but of course you don't have to. The wedge material needs to be machined to a tight fit in the mortise and not over-size, or the wedge will cut into the surrounding rail. 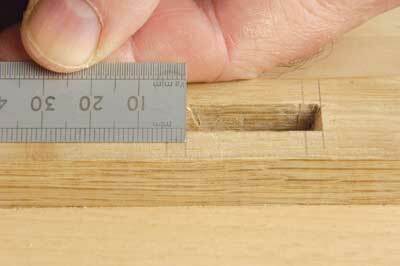 Make sure you cut a reasonably long piece as this makes it easier to handle when cutting the wedges on the bandsaw. 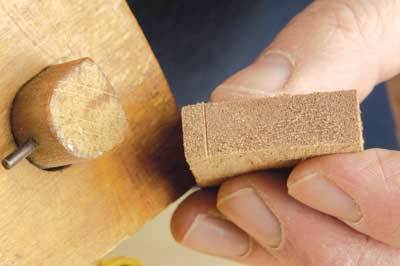 If you prefer to cut them by hand, it gives you more material for the vice to grip. If I only have a few to cut, I will cut them with a dovetail saw by hand, however it is easier to cut consistently uniform wedges with a jig on the bandsaw. 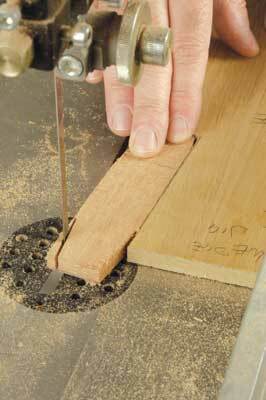 A simple jig can be made from a piece of ply; just make an angled cut to hold your blank at the right angle for the size wedge you want. This runs along the bandsaw fence. Make the wedges over length by about 6mm. All that's left to do now is glue up and drive the wedges home. The basic principles are the same for diagonal wedges. These are usually used on a retangular tenon. 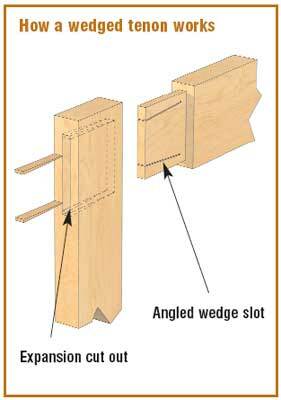 The difference between this type of wedging and a double wedge is that it is a less aggressive spread of the tenon. These can look very effective in a row on the side of a cabinet. 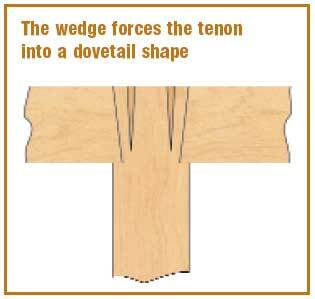 The wedge slot is only the thickness of the saw kerf, and there are no cut outs for the tenon expansion, so it is really a tightening device. It is surprisingly effective. I tried it dry on my test piece for this article and could not get it undone, so I tapped it home fully, cleaned it up, and it is still tight. Who needs glue! The wedge is essentially a flat piece the thickness of the kerf, and it is better to be slightly tight rather than loose. I taper mine on the bottom to make tapping it home easier. The thing to remember with these is that the wedge width needs to be the diagonal width of the tenon, otherwise you will find that you have a little gap in each corner. Happy wedging! "I like to keep things simple, and my favourite way of cutting tenons is on an accurately set up bandsaw"